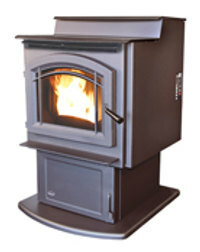 The Enviro M55 multi fuel pellet stove was introduced in the summer of 2009. It's a step top stove with an arched top door and viewing window, producing 55,000 btu. and able to heat an area of 2,500 square feet. Unusually, this stove is able to automatically ignite any of its potential fuels because the igniter is aided by an air pump which raises the temperature of the starter. The motors are capacitor driven for quietness, and a built in hearth pad is provided as part of the stove, which also has a fluted cast iron firebox liner for better heat exchange efficiency. And here's the new M55, a cast iron version based on the Enviro Empress. The specifications are unchanged. Max. Heat Output 55,000 btu. Min. Heat Output 10,000 btu. Rear Vent Height 18.25 in. Part repair or replacement for the first seven years and limited labour for the first two years to the original purchaser. Burn pot liner for three years. Electrical parts for two years. Exterior finish for one year. Hopper extension - increases capacity to 160 lbs. The Enviro M55 has the multi fuel advantages of the 'Omega', and a larger hopper capacity with the extension fitted. Clean the heat exchanger tubes and door glass. Check the ash pan and door gaskets. Empty the ash pan. Clean the inside of the firebox. Clean the exhaust venting, exhaust passages and the fresh air intake. Clean the blower motors and mechanisms. 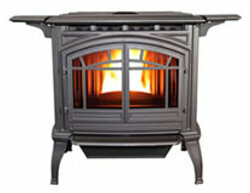 If you would like to leave a review of the Enviro M55 multi fuel stove, please use the form on the contact page.